This entry was posted on May 1, 2015 by Jessica Anderson. How Do I Recognize My Coach? Whether your kiddo is a tot or a teen, their coach is an important person in their life who deserves recognition. But what makes a meaningful gift? Show your coach how much you appreciate the teaching and mentoring they give your child and the entire team with a heart-felt gift. Coaches deserve recognition for their leadership. First, do a little prep work before choosing a gift for your coach. Ask yourself the following questions to get ideas flowing. How good was your coach? How much time did they devote to the team? What was their commitment and enthusiasm? Do they have a passion for the game? Were they knowledgeable? And most importantly, were they a role model of good sportsmanship? Find out your coach’s interests to get ideas of what the coach might find meaningful. Set a budget. Will everyone on the team pitch in for a gift? If so, how much can they contribute? Determining your budget during the season can help decide what level of gift you can give. With these questions answered, you can decide what to do. Below are various recognition gift options for your coach. To help with budgeting, they are organized by price - small, medium, large and priceless (aka Free). Also check out our Coach Gifts Pinterest Board for other inspirational ideas for showing appreciation to your coach. Gift ideas include thank you cards from the players on the team, a flower bouquet, a gift card to a favorite store, a small coach themed trophy, a signed team ball, an engraved coffee mug, or a small coach themed plaque. View our Coach Gifts and Awards page to see our large selection of Coach Trophies. Ideas include gift certificate to coach’s favorite store or restaurant, movie tickets, a popular picture plaque with a photo of the team, an engraved clipboard, clothing signed by each team member, a signed ball with an acrylic case for display, a book about sports signed by each team member, a poster collage with pictures of the season, or a whistle in an engraved box. Another idea is to combine small things around a theme. For example, if your kids play baseball, you can have the kids sign a team ball to display in an engraved ball holder trophy. For any sport, you can put a Starbucks coffee card in an engraved mug. For thank you cards, the kids can make them or you can use a team picture as the front of the card with a small gift card inside. Ideas include Embroidered Sports-Related Clothing; a jersey for their favorite college or professional team; a scrapbook with photos from the season, along with personalized messages from each team member; tickets to a professional sports team game; or a larger gift certificate to a favorite store or restaurant. 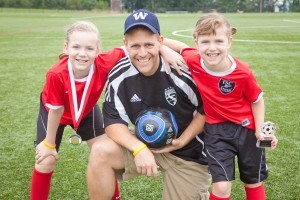 Ideas include personal calls, emails, or texts thanking the coach for a great season. Consider creating a scrapbook for the coach. Younger players can draw a picture, older kids can write a letter. Ideas for things to include: the player's favorite thing about the coach, favorite moment of the season, what they like about playing the sport, or their favorite position and why. Then these letters can be displayed in a binder or scrapbook and given to the coach at the team party. This can be a gift in itself or can be presented with one of the ideas above. No matter what you decide to do, any gesture of recognition will be appreciated. Coaches give leadership and devote time to the team and deserve to be recognized in a meaningful way for their efforts. Editor's Note: This post was originally published in October 2012, and has been updated for accuracy and comprehensiveness.